In the first three months of the year, about 25 million wearables were sold worldwide. Fairly impressive considering that the most popular choice, the Apple Watch, ain't that affordable. Then again 3.6 million of those were very cheap Xiaomi trackers which can be bought for as little as $15. We've talked about the need for smartwatch prices, say, to come down to what people think is reasonable. But how about free? The idea that wearables should be free has been around as long as this current wave of connected-self tech has. In November 2014, before Wareable existed, Frog's then chief creative officer Hans Neubert argued the point: "Make wearable devices free, and monetize the data, or risk losing out on the possibility of mass-market adoption." Companies giving away wearables is now a legit way for people to end up owning one of these devices and the trend is only set to grow in 2018. So what does this mean? Why give them away, or heavily discount them, and is there more appetite for a freebie smart accessory than one you have to pay for? We've covered the rise in health insurers offering wearable tech schemes and explored what workers need to think about before agreeing to a complementary tracker or smartwatch from their boss. The freebie wearable scene is still taking shape so we thought it would be good track who is giving away free devices and why in mid 2017. Some of them might surprise you. Either way, if you're looking to get a free or almost-free wearable, keep an eye on these trends. This is the big one you've probably already heard about and it's going to get bigger. US health insurance company Aetna is reportedly in talks with Apple to provide free and discounted Apple Watches to its customer base.. of 23 million customers. Remember, Apple only sold 3 - 4 million smartwatches in early 2017. This deal, if it goes ahead as rumoured in early 2018, could be huge for Apple and for wearable tech. Another health insurance giant, Vitality, already has the jump on Aetna - it offers super cheap Apple Watches as well as big, sometimes 30 - 40 % discounts for customers on wearables from Garmin, Polar, Misfit, Fitbit and Nokia. For years, Fitbit's own Health Solutions, previously Group Health, has run schemes at big employers like BP, Barclays and notably the Fitbit Zip giveaway for 340,000 Target workers. Networks like AT&T and Verizon are offering heavily discounted LTE smartwatches when you buy a smartphone from them. With more smartwatches likely to go standalone before the end of the year, this could be how a lot of people end up owning smartwatches. It's the tablet model all over again. So you can get a Samsung Gear S3 Frontier for $49.99 on a two year plan when getting a Samsung phone. In a funny way, L'Oreal's deal on its My UV Patch is doing exactly the same thing, despite the fact it could have a real health benefit. 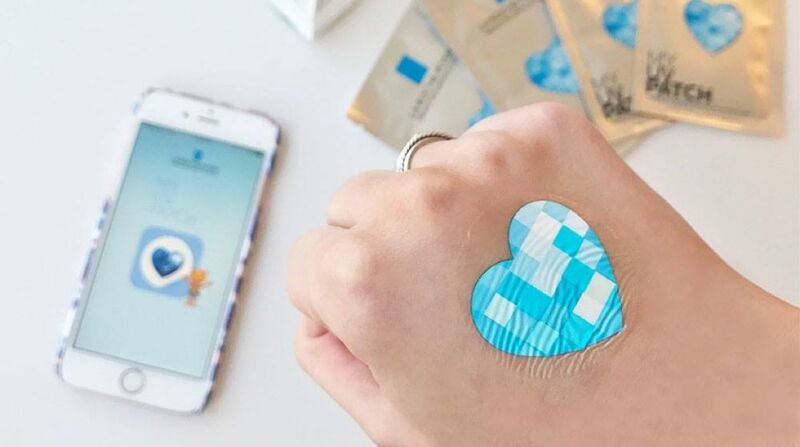 You can get one free connected patch when you buy a bottle of Anthelios Sunscreen "while supplies last" and two patches if you buy some Anthelios Dermo-Kids suncream from L'Oreal's skincare brand La Roche-Posey. Win win and no-one was buying UV bands anyway. Even a scheme like the one in Sweden which loans fathers-to-be a wearable called BuzzBaby - again a win win situation - is run by a nappy company called Lipero which requires you to be a member of its club first. Let's start with Barclays which starting giving out its bPay wearables and keyfobs to its customers for free in July. Some saw the move as a sign of weakness but you could argue that you shouldn't have to fork out money for the new way your bank or credit card provider wants you to pay for stuff. Barclays has a much better chance of dominating mobile/wearable payments by giving bPay kit away. The real poster child for this, though, is virtual reality. Both hardware and content makers are giving away headsets. Samsung has been bundling whatever its most recent VR headset is with each flagship smartphone - most recently, the Gear VR with controller free with the Galaxy S8 on pre-orders until the end of May this year. If you reckon you'll upgrade next year, look out for this sort of deal. Subscribers of the New York Times have had not one but two chances to get a free Cardboard viewer. In 2015, the paper - which has an excellent NYT VR Cardboard app - gave away one million of them followed by another 300,000 for digital subscribers in spring 2016. Expect more - they need the audience. Those three scenarios will no doubt be pretty common over the next 12 months and beyond. But we'll also see new reasons for companies to give out wearable technology. Take Deliveroo. It has started giving out GoPro action cameras to its self employed couriers as a safety prevention and recording tool after a wave of acid attacks in the city. We're already seeing these cams on the helmets of Deliveroo's riders. Still, in January 2017 only 16% of people owned a wearable in the US, less than that in Europe. We're not talking smartphone levels of use by any stretch of the imagination but it's interesting to see which devices are being chosen as perks and added extras and which can sell in their own right. The Apple Watch seems to be desirable both as a device you buy and a freebie, similar to how for years people just wanted a free iPad somehow. This is how thousands, and maybe soon millions, of people are getting into wearable tech. Maybe these schemes and discounts and bundles are essential to the next phase of connected self tech. Have you been given a free or very cheap wearable by your employer, a network or your health insurer? Let us know in the comments. Hello, I am a Doctor of Nursing Practice (DNP) student looking to work with obese 8-12 year olds and their primary caregivers to decrease weight and improve quality of life. I want to incorporate a wearable tech for self-monitoring physical activity. I appreciate the information in this article and am excited about the possibilities of a free option for my project participants. Any updated suggestions for a doctoral student seeking a free wearable for rural obese 8-12 year olds? My implementation timeline will be Summer 2019. Thank you!